Contribution to the building of Moraketiara School – by the Rotary Club of Alnwick in 2005 and on-going annual support for teaching in this school by Durham undergraduate students. Shipment of a container of goods from Delaval Middle School by Northumberland County Council for equipping the Rotary Sri Lanka Kudaththanai Karaiyoor School in Jaffna – a container of school students’ and teachers’ chairs, tables, desks, cabinets, other furniture, books , gym equipment and classroom resources. Donated 2010. School opened 2011. Provision of a range of books and classroom equipment for Moraketiara pre-school plus sports equipment for Moraketiara School by post-graduate students 2010. Provision of teacher training courses in pre-school education and a long course on the learning of the English language for all of the teachers in our Matara District villages, staged by members of the Education Ministry in Matara and University teachers in Sri Lanka and supported by undergraduate team 2010. 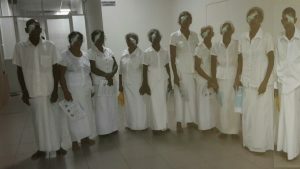 Volunteer support activities in Parartha home for young women in Colombo, 2010 and 2011. Construction of a retaining wall necessary for the preparation of land and the building of our community centre/school in Aththudawa, provided by the community of Spittal, 2010. Provision of further business advice and research support for the development of the tourism industry, eco-village development, coconut production and marketing and cinnamon production and exportation, by Durham University MBA students 2011. Pambahinna village school and community building, plus furniture and equipment, provided by the British and Foreign School Society and Durham University sports students through Project Sri Lanka, opened 2011. Aththudawa village school and community building plus furniture and equipment provided by Durham University undergraduate volunteers, opened 2011. Volunteer teaching and community development activities in Pambahinna village by Team Durham sports students, 2011 (to be continued in future years as with all other partnership villages); plus on-going coaching of students in various sports at the Sabaragamuwa University of Sri Lanka, 2011. Provision of sports equipment for the Sabaragamuwa University of Sri Lanka and the village of Pambahinna by Project Sri Lanka Team Durham volunteers 2011. Volunteer teaching at Aththudawa pre-school, plus all other Matara area Project Sri Lanka villages, plus Moraketiara School and Siddhartha College in Weligama, by Project Sri Lanka Durham University undergraduate volunteers 2011. 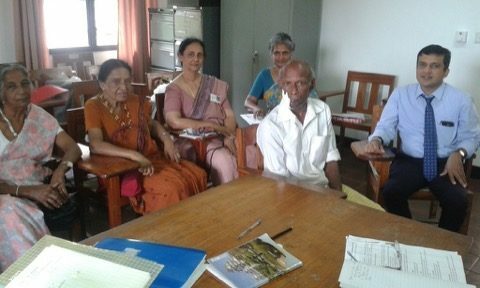 Volunteer teaching at the Sabaragamuwa University of Sri Lanka by Project Sri Lanka Trustee Professor Taylor, 2011. Ongoing teacher training programmes (in-service pre-school teacher training plus the learning of English) with teachers in Project Sri Lanka’s six Matara area pre-schools, 2011 and continuing. Volunteer teaching and community support activities in our partnership villages, Sri Sumangala College, Siddhartha College, Aruna Vidyalaya and the Sabaragamuwa University of Sri Lanka in 2012 by Trustees Alison Brown, Scott Weightman, Joy Cooper, David Cooper, and community volunteers Sandra Evans and Stephen Fletcher. Continuation of professional advice and sharing of knowledge by Durham University MBA students in 2012 in the fields of sustainable tourism, national parks and the textile industry. Donation of silver sports trophy for Rotary Sri Lanka’s Kudaththanai Karaiyoor School in Jaffna, by the Rotary Club of Alnwick. 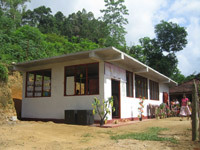 Vikumgama community building and pre-school, funded by Durham University undergraduate volunteers and by Project Sri Lanka, opened July 2012. Volunteer teaching at Vikumgama, the other 6 Matara area villages, the 3 Ratnapura District villages, Aruna Vidyalaya, and the Sabaragamuwa University of Sri Lanka, by Project Sri Lanka student volunteers 2012. Construction of a water supply pipe and pump for the pre-school/community building at Rassandeniya, completed 2012. Refurbishment of the Pre-School at Mapalagama and provision of a complete set of new equipment for the classroom and outdoor play area. This refurbishment exercise included the construction of a hygienic toilet facility with wash basin. Donation of a substantial amount of equipment for the Centre for Handicapped in Kandy. 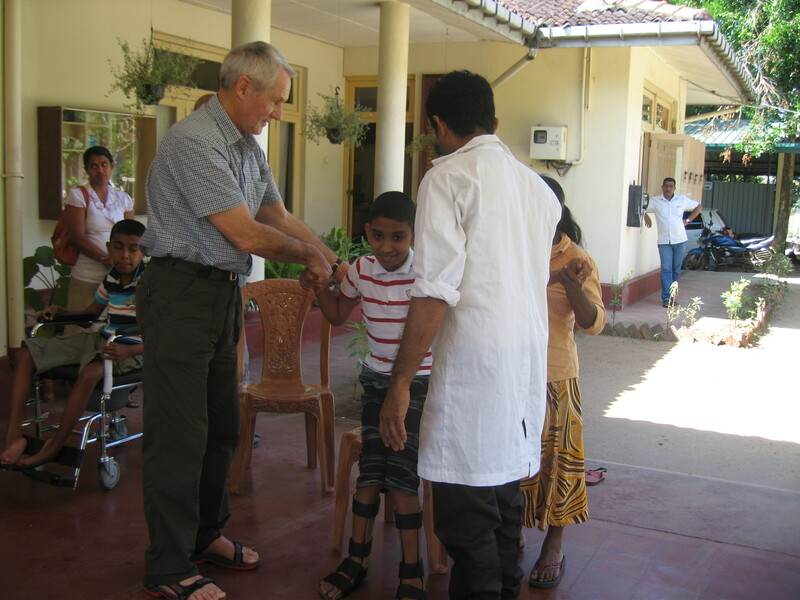 This included materials for the construction of prosthetic limbs for amputees and other items of mobility equipment. Full details will be found in the donation report on the Centre for Handicapped page of the website. 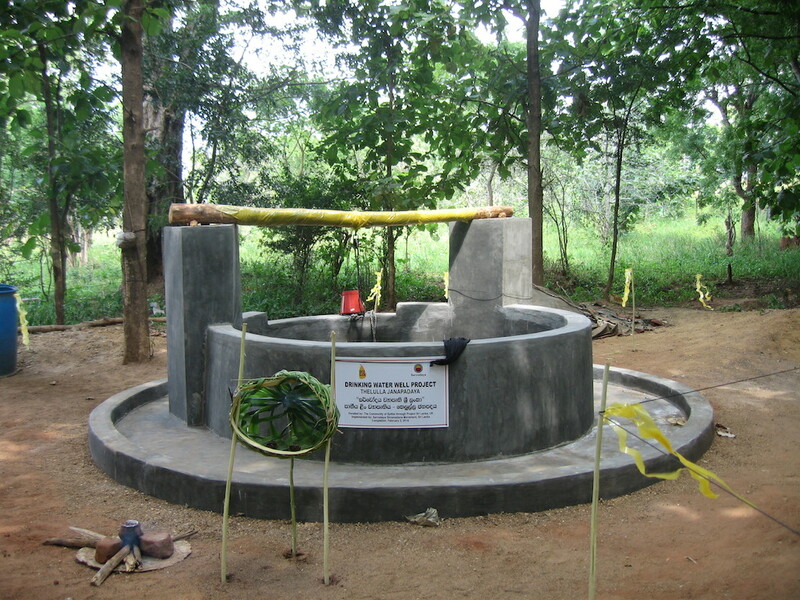 Provision of an agro-drinking well in the village of Walaskema in the Wellawaya area enabling village families to have access to water throughout the year. This project was adopted in 2014 and the well officially ‘opened’ in July 2015. Provision of four further further agro-drinking wells, opened in January 2016. These lie in the villages of Paranapara, Parakumpura, Samagipura and Weherayaya all in the Tanamawilla and Wellawaya areas of Sri Lanka. Provision of a 4 toilet sanitation block with tank and piping at Mallapitiya Vidyalaya, 20km from Kandy town, January 2016. 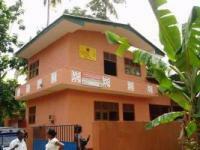 This provides desperately needed toilets for 700 pupils and staff. 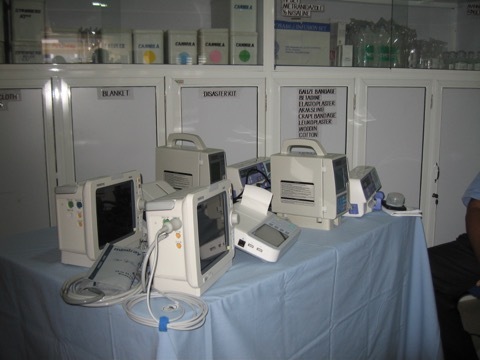 Donation of equipment for the Emergency Treatment Unit of Kandy General Hospital, 2016, including two ECG machines, two heart monitors, two infusion pumps and two syringe pumps. Provision of an agro-drinking well declared officially completed in the village of Manelgalla in the Wellawaya District, 2017. Provision of an agro-drinking well declared officially completed at Veheragala near Habarana, 2017. Donation of four further syringe pumps for Kandy General Hospital, 2017. The inauguration of a two year project focusing on awareness, detection, prevention and treatment of oral cancers in association with the Faculty of Dental Sciences at the University of Peradeniya and Cancer Care Services in Sri Lanka, 2017. This project is the recipient of a Rotary International Global Grant in recognition of international donors with Project Sri Lanka as the major donor. The inauguration of a water purification project in the village of Morawewa in the Trincomalee District, 2017 which will enable 9,000 village people to access purified water in an area of chronic kidney disease caused by water contamination from pesticides. and surgery fees. Operations took place in late 2017.
with flood water in 2017 and all equipment was destroyed. The donation of a range of equipment to support paediatric oncology surgery at the hospital of the Peradeniya Dental Faculty in Kandy. Project Sri Lanka is a substantial donor for this project which is also in receipt of a Global Grant from Rotary International.